These discounts cannot be use in combination with any other offer and will only be applied on the basis of completed membership terms. When using our special offers, inhabited nights will be automatically counted but the discounts will not be combined. However, all other benefits related to the card membership are included. The card is non-transferable. The discount is applicable only to the person registered to the card. Complete this form and become a member! Hand the completed application form to the hotel reception or post it to the hotel address. 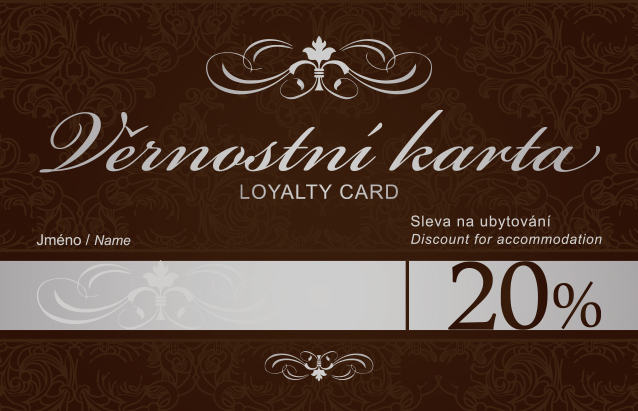 You will receive your loyalty card by post. We will inform you of services that could be of interest to you and your family. With your signature you confirm acceptance of membership in the loyalty programme and the processing of personal data, which will collected be only for internal purposes of the hotels. Windsor and Zátiší, Špindlerův Mlýn.